we keep a full range of high-quality products in stock for our customers. Benefit from our many years of experience in dealing in Stainless steel and duplex steel. We specialize in manufacturing Fasteners in All Sizes & Grades, We are the biggest producers for stainless steel bolts and nuts in India, as our name suggests we are manufacturing big bolts and nuts in stainless steel grades in the under mentioned table. We offer Stainless steel Fasteners in various grades., Over the past few years we have manufactured many different kind of stainless steel grades of bolts and nuts, however the the above grades mentioned in the table are the main grades which we are manufacturing consistantly. With constant improvememt in quality we have been able to excell in the manufacturing process for the above steels and their respective grades. Raaj Sagar Steels is the biggest and the largest producer for stainless steel ( SS ) hex bolts, hex screws, hex nuts, washers in India, Raaj Sagar Steels is an international supplier of Stainless Steel Bolts.These fasteners manufactured in Stainless Steel and Duplex steel Fasteners, we also manufacture hex bolts, hex screws, hex nuts, washers at our other factory in Vapi, Gujarat. Where we also manufacture Stainless Steel Bolts and Stainless steel Screws & Nuts for industries like Oil & Gas, Petrochemicals, Refineries, Thermal, Nuclear sector, Solar Power Plants, Atomic Energy, Defense and Aerospace etc. , We produce all types of SS products which are used in marine, sewage, water and desalination plants in counties like, Oman, U.A.E., Qatar, Dubai, Bahrain, Saudi arabia. Our popular Stainless steel bolts and nuts, SS 304 bolts and nuts, 304 fasteners, 304 Nuts and bolts, 304 bolt nut, 304 nut bolt, 316 Bolts and nuts, 316 fasteners, 316 hex bolts, 316S31 bolts and nuts, stainless fasteners. Aloy steel grades used in our factory are 40 Cr, 42Cr MoV4, EN 18, EN 19, EN 24, EN 31, we also use alloy steel grades in petrochemical and oil and gas industry. At Raaj Sagar Steels, we dedicate ourselves to the pursuit of excellence. Our vision is to be market leaders in the supply of Stainless Steel grades of bolts and nuts, however the the above grades mentioned in the table are the main grades which we are manufacturing consistantly. With constant improvememt in quality we have been able to excell in the manufacturing process for the above steels and their respective grades. Raaj Sagar Steels manufactures and exports the entire range of Petrochemical stud bolts, alloy steel bolts, alloy steel bolting, alloy steel stud bolts, stud bolts oil and gas, B-7 stud bolts the popular grades of Alloys steel are from ASTM A 193 / SA 194 and A 194 / SA 194 grades like B7, B7M, L7 and L7M grades. We are dedicated to producing high quality custom built bigger diameter bolts and nuts in India, as our name suggests we are manufacturing big bolts and nuts in Duplex steel grades in the under mentioned table. We manufacture duplex steel bolts as per grade Alloy 2205, DUPLEX steel is a mix of Austenite and Ferratic steel microstructure, which is why they are also known as Duplex steel. They also have great resistance to corrosion and have higher strength as compared to stainless steel grades like 316 or 304. Carbon steel grades of steel are generally used in manufacturing low carbon steel bolts and nuts mentioned above in the above standards, gradesupto 6.8 are in non heat treated condition whereas bolts from 8.8 and above are heat treated to provide them with extra strength. Sometimes steel additions like Chromium and molubednum are added in the steel to provide the correct stregnth required as per high tensile grades. Duplex bolts, duplex steel bolts and nuts. 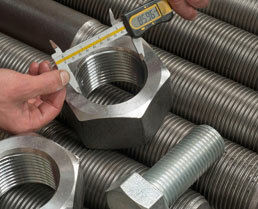 Mild steel bolts and carbon steel grade bolts manufactured by us are mentioned below. These are used in general engineering and where there is low load applicable. We use only the best quality in Stainless Steel and our products are never a shelf item but developed to a design that not only works for you but meets all Indian Standards., We manufacture and export the entire range of carbon steel bolting used in engineering and the contruction industry all over the world. These are also high tensile bolts and nuts and the popular standards like 8.8 and 10.9 grade are manufactured in our factory in India. 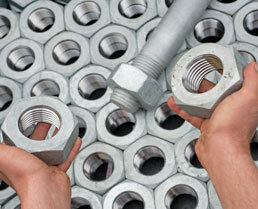 We produce and export over 200 tons of high tensile fasteners to middle east and Europe. We also manufacture mild steel bolts and nuts, 4.6 grade bolts and nuts, 8.8 grade nut bolts, 10.9 grade bolts and nuts, carbon steel bolts nuts, nut bolt. We also specialize in Industrial HV Bolts & Nuts as per DIN EN 14399-4 10.9 in Hot dip galvanised finish, DIN EN ISO 4014 , 4017 / DIN 931 / DIN 933 Bolts for Heat Exchangers, Pressure Vessels, Refineries Plants, Chemical Industries, Petrochemical Industries & Fertilizers Industries.. Our high tensile bolts are used in the heavy industry, marine, ship building, oil and wind energy. We manufacture the complete range of Bolts, sets, sockets and nuts.Some of the other products manufactured by us are foundation bolts, anchor bolts nuts and washers for the above bolts and petrochemical grade stud bolts. Raaj Sagar Steels nut manufactures and exports Hex nuts and heavy hex nuts as per the details below from 1/2" to 3" and M-12 to M-72 diameter. We aim to conduct business in a professional and friendly manner with a fast and efficient service., Guided by a philosophy to produce safe, sustainable products, Raaj Sagar Steels is a leading manufacturer of SS Heavy Bolts & Tapping Screws in Mumbai India. We supply ASTM A453 GR 660 Fasteners,A286 Industrial Steel Fasteners,A2-70 Stainless Steel Hex Bolt,SS heavy hex bolts, SS finished hex bolts, SS oval neck track bolts,SS bent bolts, SS hex cap screws, SS heavy hex screws, ANSI/ASME B18.2.1,B18.2.2,B18.2.3 Fasteners,A2-70 and A2-80 DIN 934, A4-70 and A4-80 Stainless Steel Hex Nut, DIN 934,ASTM A193 Grade B5 Fasteners,ASTM A193 Grade B8 Fasteners,A193 Grade B8 Class 2 Fasteners,ASTM A193 Grade B8C Fasteners all major markets including construction, manufacturing, infrastructure, packaging and agriculture. Key Tags - Stainless Steel Fasteners | SS Fasteners 304 | Stainless Steel Fasteners 316 | SS Fasteners 316| Stainless Steel Fasteners Manufacturers in India. Our main line of manufacturing is petrochemical Stud bolts, petrochemical stud bolts, double ended stud bolts, collar stud bolts, shoulder studs, tap end stud bolts, we manufacture these products in stainless steel ( SS ), alloy steel and carbon steel grades used in the oil & gas industry for pipelines and flange joints, Our factory which is situated in Kundli in India is producing these products for customers in petrochemical and oil & gas industry in Middle eastern countries like, Dubai, U.A.E., Omam, Qatar, Saudi arabia, Bahrain, Iran, Iraq, Jordan etc . The first step in any project is always the foundationing work, Raaj Sagar Steels manufactures all types of L type foundation bolts, J type foundation bolts, straight foundation bolts, plate type foundation bolts in stainless steel ( SS ) alloy steel and carbon steel grades in our factory in Haryana in India we are also having our distributors and dealers all over India and Middle east like, Bharain, Saudi arabia, Qatar, Dubai, U.A.E., Oman, Iran, Iraq etc. Socket head cap screws or bolts are manufactured by us in carbon steel, alloy steel and stainless steel grades in 8.8, 10.9 and 12.9 grades. Please see below the details. Raaj Sagar Steels also manufactures and exports the entire range of Socket products in Stainless steel, alloy steel, carbon steel and mild steel and we are currently the largest producers for bigger diameter socket products and are exporting this to Middle eastern countries like Oman, Qatar, Bahrain, U.A.E., Dubai, Saudi arabia. Our Socket head cap screw, socket head screws, socket set screws socket screws, allen head screws, allen screws are manufactured in alloy steel grades in 10.9, 12.9 and 14.9 grade also. We can also provide top coat finish like, Zinc, aluminum flake, PTFE., flourocarbon and HDG. We manufacture all threaded low carbon rods, and full threaded studs in alloy steel and stainless steel grades, please see details below. Our company also manufacturers low carbon threaded rods and all thread rods in 3', 6', 12' and 15' in plain, zinc plated and hot dip galvanised finish, we are exporting these rods to many countries like USA, Europe and middle east. We also distibute and market the following products in alloy steel, carbon steel and stainless steel grades for the following products in DIN 975. Thread rod, threaded rod, thread bar, threaded bars, low carbon thread rod, all thread rods.